Reid Lifting has delivered 75 lightweight gantry cranes to Speedy Hire, as the rental company looks to leverage the inherent suitability of the range to short-term usage. 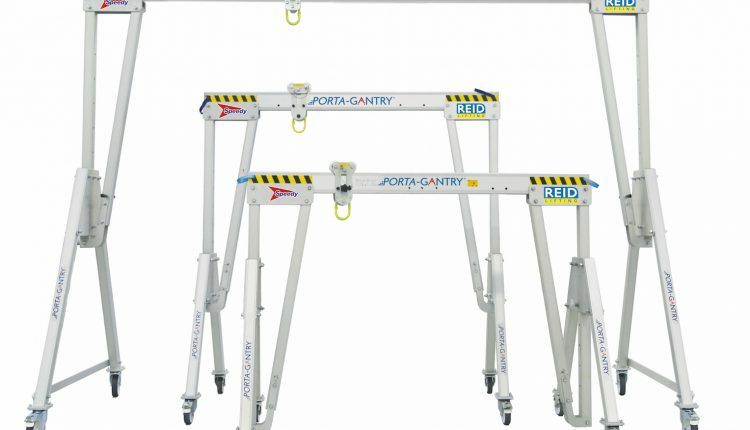 Speedy, which has a specialist lifting division that offers an abundance of equipment for material handling and other applications, placed a landmark order for the gantries, predominantly for 2,000kg working load limit (WLL) units. The total order comprised 40 Tall Porta-Gantry cranes, 30 Intermediate Porta-Gantry systems (all 2,000kg), and five 5,000kg capacity Tall Porta-Gantry products. All were standard items but part of the new ‘winch ready’ range, which gives the user the ability to convert the gantries for use with the mechanical hoisting device with ease. Reid’s equipment is among the fastest moving at Speedy’s dynamic operation, thus, delivery was coordinated in line with its ever-changing order book. The collection was divided into four shipments and based on ongoing dialogue with the hire team, manufacturing priority was given to items in the greatest demand.